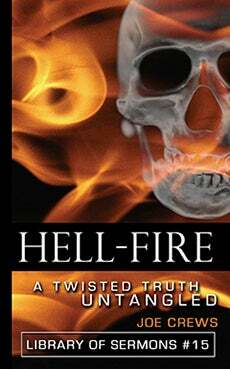 Does So Many People Believing in Eternal Hell-fire Make It True? It is true that many have believed this for many years—including famous historical and current leaders of the Christian church. Although it is tempting to believe something because many others believe it, we must look to the Word of God as the basis of our beliefs. God’s Word is unshakable, while the opinion of the crowd is certainly not. During the week before Jesus’ crucifixion, many of the same crowd who called out, Hosanna! and sought to put a crown of gold on His head, called out, Crucify Him! and sought to place a crown of thorns on His head—just a few days later. 1) “The wicked shall perish ... they shall consume; into smoke shall they consume away” (Psalm 37:20 KJV). 2) “ ‘Behold, the day is coming, burning like an oven, and all the proud, yes, all who do wickedly will be stubble. And the day which is coming shall burn them up,’ says the Lord of hosts, that will leave them neither root nor branch” (Malachi 4:1). 3) “Fear Him who is able to destroy both soul and body in hell” (Matthew 10:28). 4) The disobedient “shall be punished with everlasting destruction” (2 Thessalonians 1:9). In Galatians 1:8, Paul was intense about the pure gospel being preached. He said, “Even if we, or an angel from heaven, preach any other gospel to you than what we have preached to you, let him be accursed.” He was so adamant about this that he repeated himself in the next verse: “As we have said before, so now I say again, if anyone preaches any other gospel to you than what you have received, let him be accursed” (verse 9). In verses 11 and 12, he made it clear that the gospel they received from him “is not according to man” but came “through the revelation of Jesus Christ,” who is the Word of God (John 1:1–3). Anything that contradicts the Word of God is another gospel. The Bible says, “The wages of sin is death, but the gift of God is eternal life in Christ Jesus our Lord” (Romans 6:23). It would be another gospel that states that the wages of sin is not death but eternal life in hell. In John 3:16, the most famous verse in the Bible, Jesus said that “God so loved the world that He gave His only begotten Son, that whoever believes in Him should not perish but have everlasting life.” If the wicked will burn endlessly in the fires of hell, then there will be no difference between those who believe and those who don’t. Both groups would have eternal life and Christ’s death would be meaningless. The Bible uses the words “forever,” “everlasting,” and “eternal” in different contexts. Jude 1:7 reports that the ancient wicked cities of Sodom and Gomorrah suffered “the vengeance of eternal fire.” Are they still burning today? In his prayer to God after being swallowed by the great fish, Jonah lamented, “The earth with its bars closed behind me forever” (Jonah 2:6). Yet he was inside the creature only three days and three nights (1:17). Jesus used an entirely different context in John 3:16, where He said that those who believe will have “everlasting” life. This is certainly not three days and three nights as in Jonah’s case, nor is it as long as a human life as in Samuel’s case. It is forever! It is clear that the Bible’s use of “forever,” “everlasting,” and “eternal” refers to however long it takes for God’s righteous purpose to be fulfilled. No matter how many people believe that hellfire will burn the wicked endlessly, the unshakable Word of God declares that “affliction will not rise up a second time” (Nahum 1:9). If it “will not rise up,” that means it will first be discontinued. The fire will not be a torturing fire but a cleansing fire that will finish the work of God’s righteous purpose.